My colorful art skates between Impressionism and Realism, and evokes feelings of joy. Thus, my fine art paintings are dubbed Beacons of Joy. Queen Shy original paintings hang well with Abstract or Traditional Art. My color mixing system is created to be designer friendly and compatible with the latest in decor accents. 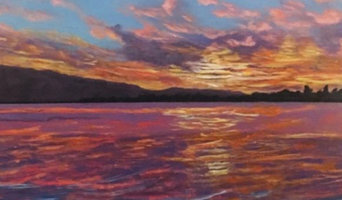 Queen Shy Serene Seascapes & Tranquil Gardens/Scenes collections are awe inspiring. Come EXPLORE AND ENJOY the beauty Queen Shy brings to canvas. Finish carpentry and millwork specializing in the high end construction market. 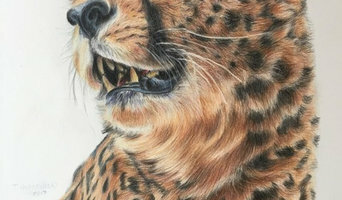 I specialize in realistic wildlife art using the mediums of colored pencil, charcoal and pastels. Each piece focuses on details in each animal as well as the importance of their existence. I also offer pet portrait commissions. I've always found myself intertwined in two worlds. On one side it's the world of art and on the other it's animals. Combining the two together has been my goal for many years now. I am often asked why do I create works of art around animals and nature? We take this world for granted daily. This planet gives us beauty, a sense of wonder, curiosity and humanity. Let's stop from our hectic lives for a little while each day and take in what is all around us. We shouldn't forget how closely we, as humans, and animals are connected. Think of what this planet would be like if these creatures were gone. We have a responsibility to ourselves, our children and our home to care for nature and all of her creatures. Letting others see how I view wildlife is only part of my work, the bigger impact is how I can help this world heal through art, education and example. Let the adventure begin. Letting others see how I view wildlife is only part of my work, the bigger impact is how I can help this world heal through art, education and example. Let the adventure begin. First ever created Rhinestone Art Picture by local Las Vegas artist. The images on the picture are decorated with colorful, shiny rhinestones, and are handmade. In fact, the rhinestones are added by hand, one by one. Because of the sizes of the stones and the way they are attached, the texture feels a bit like 3D! They are packed with “BLING!” and are very eye-catching! Very unique and elegant decor for restaurants, lounge, hotels and luxury homes. This is a beautiful, unique, and elegant style of art that would make a great addition to any collection, and would brighten up the decor in any home. Also will look amazing in a hotel lobby, high end lounge or restaurant. SPECIALIZING IN: Large Scale Original Abstract Art, Contemporary, Minimalism, Modern Art and Custom Paintings. I'm new to the houzz community and will have tons of paintings uploaded ASAP! UPDATED ON: 5/9/18 Hello, my name is Bethany Sky Whitman, I am a self taught artist and paint full time for a living, 7 days a week, 12 hours a day. My only goal is to create high quality beautiful paintings and custom artworks as well as providing the best customer service available. I was one a small handful of artists to break into the internet art scene way back when it all began in the early 2000's. I'm honored to say that I have sold 1000's of painting's worldwide and have maintained a perfect 5 star rating from my amazing clients ever since. I work closely with private collectors, interior designers, architects, home stagers and movie set designers to help achieve their design goals. I have recently moved my art studio from Fort Lauderdale, FL to Las Vegas, NV temporarily. Next stop??? Most of my clients along with the designers I work with are based in NYC and CA so it's going to be a hard decision but an exciting one! THE TOP FIVE COMPLIMENTS RECEIVED FROM MY EPIC CLIENTS ARE... #1- Photos don't do the art justice, paintings look so much more amazing in person! #2- Quality far exceeded my expectations! #3- Bethany is so friendly and easy to work with! #4- Super fast communication and happy to answer all questions! #5- Very strong packaging and fast shipping! ART FEATURED IN: PARAMOUNT Painting titled "Wanderlust" on the set of the Paramount Pictures movie "Daddys Home 2" - starring Mel Gibson, Mark Wahlberg, Linda Cardellini, Will Ferrell & John Lithgow NBC Painting titled "Indecisions" a permanent fixture on the set of the NBC comedy series "The Good Place" Starring Ted Danson & Kristen Bell HGTV Four custom paintings were created for a spectacular home including a custom 30"x72" that has become the center focal artwork in the breathtaking 8 million dollar kitchen featured on HGTV's Million Dollar Rooms. IN THE END: More than anything, I love the connection I share with people through color and the creative spirit. DeSimone Customs specializes in transforming your ordinary house into an extravagant dream home for the ultimate living pleasure. The possibilities are endless. Get your own complete custom look by turning boring walls into beautiful feature walls and old worn out carpet to gorgeous hardwood floors. 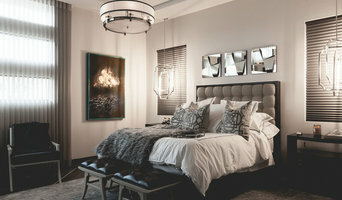 Transform those plain old rooms to luxurious living spaces. Let us make your dreams become a reality and create a home that you are proud to show off and entertain in for years to come. I draw a huge variety of artwork for home, office or hotel decorations. I enjoy creating different types of art to keep things interesting from traditional serious themes to the comical. Expect the unexpected! Modernist Cuisine Gallery, located at The Forum Shops at Caesars Palace in Las Vegas and New Orleans' French Quarter, features large-scale, limited-edition artwork by photographer Nathan Myhrvold. It’s the first gallery in the world to focus solely on food photography by a single artist. 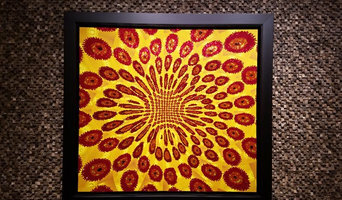 Designing a cool and eclectic mix of one-of-a-kind artwork and custom framing over at MusicScene Art.Design.Studio. We are artists, interior stylists, graphic designers, copywriters and art curators in the dynamic city of Las Vegas, Nevada. We have completed a wide range of projects including residential art commissions, hotel and casino design projects, as well as restaurant and retail custom wall decor and signage. Providing design consultations and hands-on management of residential and commercial artwork design, framing and installation. I specialize in making custom backyard BBQ pits, and Industrial Furniture. Here at Sportalk Memorabilia we put our customers first, and we make sure they leave with a smile! (and of course their beautiful piece of autographed memorabilia) Every piece of sports memorabilia comes with its own certificate of authenticity from our very own Marty Rodick Sportalk! He has the sports knowledge and credibility to prove each and every piece is genuine and on of a kind. We would love to hear from you, either by email at sportalkmemorabilia88@gmail.com or any of the social network channels. Online marketplace dedicated to adorning the home with beautiful artwork. Find your perfect fit in style, color, and size! Rod Tenbrink established Castle Framing INC in Henderson, NV. He received his NV contractor license in 1995 and brings 36 years of construction experience to the Las Vegas Valley. With expertise in remodeling, cabinetry and framing, our reliable construction crews can handle complex, simple, commercial or residential projects. Some of the Services We Provide Include: -Basement Finishing -Bathrooms -Decks -Kitchens -New Custom Homes -Patios -Room Additions Add beauty and function to your home by adding space for your family to work or relax with a new deck, family room, bathroom or kitchen. From floor to ceiling, trust us to make the best out of your home, office, retail space or restaurant. Castle Framing Inc can provide you with the most attractive and solidly built rooms and designs as well as repairs, maintenance and finish carpentry for your home or business. We offer free estimates and consultations and will give you a fair price for all our carpentry and construction services. From our headquarters in Henderson, NV, our construction crew delivers onsite work throughout the Las Vegas valley on time and within the budget specified. We accept payment only when the job is completed to your satisfaction. Our skilled team of professionals has industry experience and skills, developed over decades, that cannot be beat in Henderson, NV and the Las Vegas metro area. We would be happy to answer any questions you may have about our services. Feel free to browse our site to view more of what we can offer. Contact us at anytime for more information. Custom Built Furniture and finish carpentry and all your interiors design needs.